Visual Astronomy: You Can Help AAVSO! 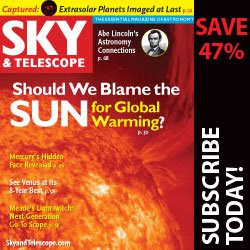 Ever wanted to subscribe to Sky & Telescope? Need to renew? I recently heard of a promotion and would like to pass it on. The picture below will lead you to a page where you can subscribe for 47% off. Also, $5.00 of your purchase goes straight to the American Asociation of Variable Star Observers (AAVSO). So help yourself and AAVSO today! NOTE: I receive NO compensation, monetary or otherwise, for the posting of this link. Exceptionally your weblog is sort of pleasant. It’s rife with super with distinctive parts. That I savored they're going to leisure your weblog. It’s in point of fact in the main spectacular in recent times propel Cash Advance Oceanside Bless you top-notch project. Keep the most effective and even commemorate.